One thing you are going to see very quickly is that I am very big into cancer awareness. I knit chemo caps for my local cancer center, for example. I’ve participated in Relay for Life. 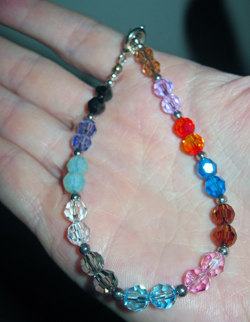 Another thing I have made are beaded cancer awareness bracelets, which is my focus here today. I make these bracelets as my own personal fundraiser for the American Cancer Society. I donate a portion of the cost. I also have made them for a Chinese auction for a fundraiser for a friend who had cancer, too. Here’s a little about as to how I make them. I use Swarovski crystal beads, sterling silver beads, and sterling silver findings. The wire is also sterling silver. 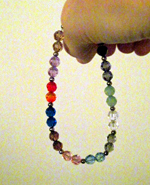 The crystals I use are 4mm and the sterling silver beads are about 1mm. You can use a clasp of your choice. The finished product is about eight inches long. I recommend going through Fire Mountain Gems’ selection of Swarovski crystals and select the colors you see fit. 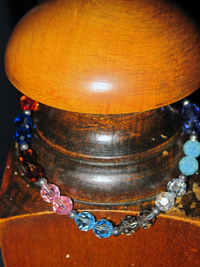 If you don’t want to use Swarovski crystals, Czech fire polished glass beads are also an excellent choice. Arrange your beads in the order you would like. I space them out with the sterling silver beads. Cut your wire, attached your clasp and crimp beads, and start stringing. Finish up with your last crimp bead and clasp. You have your bracelet. Other ideas to make it your own: Make one is a single color representing a single type of cancer awareness. Add ribbon charms or other charms that may relate, such as ones that represent a person in your life that has suffered with cancer. What do with the bracelets: Sell them as fundraisers for the American Cancer Society or a specific cancer organization. Make them as a fundraiser for your Relay for Life team. Give them as gifts to patients and survivors. I hope this tutorial-of-sorts gave you some beading ideas. I’m wearing my bracelet right now and remembering those who fought this disease. Some have survived, others lost their battle. They are all in my heart.